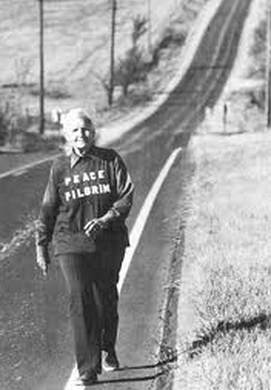 Over the years I have been much inspired by Peace Pilgrim, who renounced her possessions and walked over 25,000 miles for world peace. Here is a sampling of her wisdom, drawn from the book of her writings that was published posthumously. To learn more, browse her book online. There is great freedom in simplicity of living. A persistent simplification will create an inner and outer well-being that places harmony in one’s life. I pray without ceasing now. Praying without ceasing is not ritualized, nor are there even words. It is a constant state of awareness of oneness with God. 1. Peace Pilgrim: Her Life and Work in Her Own Words, Peace Pilgrim (published after her death by Ocean Tree Books, 1992). This is available as a book or online at http://www.peacepilgrim.org/book/index.htm. 4. The image is from the cover of the book Peace Pilgrim: Her Life and Work in Her Own Words.